Very uncommon to rare. 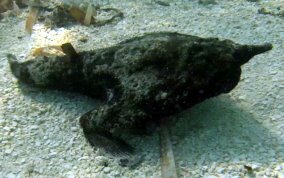 The Shortnose Batfish has a long pointed nose (but not a 'real 'nose') projecting from between his eyes. . Tail has two dark and one light broad bands on its tail. Colors and mottling can vary from reds and browns to whites and creams. The older the fish, the shorted the nose seems to be. This fish could be considered a living evolutionary, transitional species. 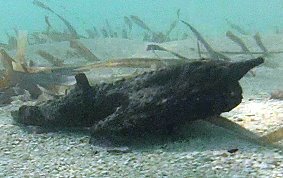 His ventral fins have evolved to be used almost like front legs, and its pectoral fins have receded to the rear of his body and are used much like hind legs. Thanks to Alex Herman for these photos taken at Caye Caulker, offshore Belize, which he sent me to identify. They are also known as the Longnose Batfish. There are four Atlantic batfish species. 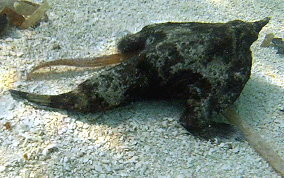 Only two are even rarely found in the Caribbean. On 06-22-17 Tom Krall saw one at Waterlemon in about 25 feet of water, so I'm adding this species to the gallery.